A new Star Wars movie has arrived every year since 2015 but it sounds like that won't continue after Star Wars 9 in December. A Bloomberg interview with Disney CEO Bob Iger revealed that the company plans to take "a bit of a hiatus" with its cinematic Star Wars output after The Rise of Skywalker. Iger confirmed that Disney is working on more new Star Wars movies to follow Star Wars 9, but "we have not announced them." This doesn't mean Star Wars as a whole will disappear from the entertainment sphere, as projects like the Star Wars: The Mandalorian TV show could continue for years and we may even see a sequel to this holiday season's Star Wars Jedi: Fallen Order video game. Iger positioned the hiatus as a natural response to the finality of Star Wars 9, the end of the Skywalker saga's trilogy of trilogies. He steered well clear of acknowledging any potential for Star Wars fatigue among audiences, despite the franchise-low theatrical performance of Solo: A Star Wars Story in 2018. Mark Hamill made no such distinction when the topic of Solo was raised in a separate interview with The Hollywood Reporter. "I'm not gonna tell them how to run their business, but is there a possibility of 'Star Wars fatigue'? Yeah, I think there is. I've experienced it, to a certain degree. But they never listen to my ideas anyway, so who needs 'em?" 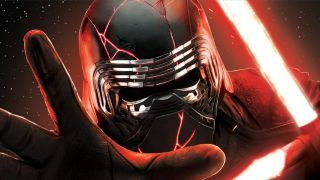 The hiatus isn't here yet - read through our Star Wars 9 trailer breakdown to see what you still have to look forward to. Or get ready for the end of the Skywalker saga with our video breakdown of the Star Wars timeline.